[Charlie X-Ray] is having some modern fun with the phone system by pulling dialed numbers from the audio track of YouTube videos (translated). The first step was to find a video where a telephone is being dialed and the sounds of the keypresses are audible. You can’t tell those tones apart, but a computer can. That’s because each number pressed generates a combination of two out of seven closely related frequencies. 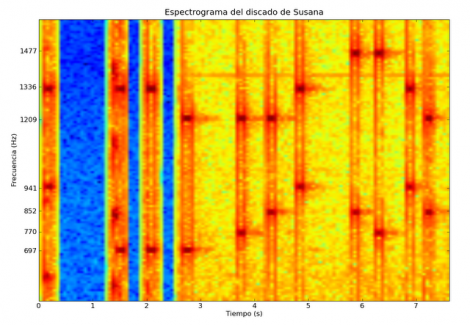 [Charlie] isolated the audio using Audacity, then wrote a python script to generate a spectrogram like the one above. By matching up the two dark nodes you can establish which two frequencies were played and decode the phone number being dialed. So how does this work again… find audio of a phone being dialed, decode the number.. profit? Yay, DTMF for the win! I am still waiting for the 1st proof of concept for our live mining by using face reconstruction on all the pictures and movies available at the net. Actually, on most of these phones if you listen close enough you CAN hear the difference. If you can isolate the audio of the DTMF tones, you can just play the audio into the mouthpiece of your phone when it’s at a dialtone, which will dial the number. Lol. This is good. It makes me think of that clip on hak5 from the toorcon clip. The term seems to be very loosely used here. Anyway, sounds like a good exercise. Good on him. This isn’t exactly anything new, frankly if there’s little background noise you could hold a phone (with a dialtone) up to the speaker and it would dial the number. Or just use a dedicated DTMF decoder IC (they cost pence/cents)? Though a fun exercise, how exactly is this related to phreaking? Wouldn’t this only work on touch-tone phones? He plays a recording of tones into a phone, presumably to an operator or computer with speech recognition, and receives back the number of the assassin, Jobert. @Nich: No, even if you have an antique dial pulse phone, the tones are decoded by your local phone company. As for preaking uses, this kind of stuff can be used to steal voice mail and other access codes, although I doubt you’ll pick up much of that from youtube videos. The easiest way to decode a DTMF signal is by using a dedicated chip such as the MT8870 ($1.5) plus a microcontroller. If you have a pc handy some software solutions are available like this one (for windows but open source). If you hold the microphone of an analog phone to your computer speakers and then play the clip, the number will be dialed. You wouldn’t know what number is being dialed but you would get connected to the number :) It’s the same way blue boxes used to work back in the phreaking days. Brilliant!!!! I’ve thought of doing this before with hardware… but modern technology makes it so much easier!!! (laughing) so cool. You can decode the bit-stream header and adjust it too on off-audio. I seen this done when ‘vlogging’ first came around to pwn people..
Also..isn’t hak5 to hacking culture what MTV is to the music industry? None of the people on there actually have talent. It’s produced media backed by multiple marketing companies. Interesting, but any tone decoder chip could do this too. I mean, after all, that’s how it’s been done in the past. This is just a more technological way of doing the same thing. I guess it does get rid of external components. But I’m not sure why you’d want to do this anyway. Are there phone numbers in youtube that I should be really interested in to start with? I don’t recall ANY dialing in any of the video’s I’ve seen. Who are they calling that I should be interested in?? Correction, phones play a combination of 2 out of EIGHT (8) tones, not 7. Just cause you don’t have/see buttons for the 4th column doesn’t mean they arn’t there. @George J: The only time I’ve seen people dialling in a youtube video is for prank calls. Most of these pranksters seem to use Skype which I believe doesn’t use true DTMF but instead a single emulated (if you like) tone that is the same for each number. See Soundminer: A Stealthy and Context-Aware Sound Trojan for Smartphones on Apu Kapadia’s research publications page for an example of using that technology on Android to steal credit card numbers. Why not simply bandpass and Goertzel it ?! This is a snap to do with MATLAB. Once you have your audio file, you just import it and generate a very nice spectrograph! It takes 5 minutes to code! by the way ‘SoX’ has a builtin effect for producing spectrograms. I’m suprized noone posted the number! Ummmm, ever heard of a DTMF decoder IC? This has been done a thousand times over, without the need for a computer. This is not “Preaking”. I am assuming that’s what you meant when you said “freaking”. This site is so pathetic. Wow. That’s real phreaking, HaD is only interested in “freaking” on youtube. I’m guessing from the title that mike is just looking for girls dancing in a risque fashion rather than hacking. Dial a pager or voice mail that has a “leave a callback number” option. Then play the tone audio into the mic of the phone. No python required. i agree with Fallen how do numbers get dialed on youtube? You could also use Multimon to do this in an automated way. I’ve always liked Baudline for generating spectrograms. There used to be a pair of twins that were blind and could tell you what number you dialed from across the room by the sound. Kudos to someone who can find more info! DTMF Decoding, nothing new sorry. Ive seen them on circuit boards with an LED display of each digit pressed, sorry. Must add, :) i used to have an old school phone that had an actual bell. very fun. but using the phone base to dial numbers is very possible (hitting the hang up thing with the proper timing) but i dont recomend it. dialing 911 on accident is a biatch. I still think it is a good skill to know for phreaking. Phreaking (not freaking) is not dead! This isn’t a new trick. You can always just grab DTMF decoder software. You might have to mess around with some audio filters on ‘Adobe Audition’ but should generally work. Been doing it for a while. Why do manually which has already provided automatically? I imagine this guy just wanted a project to work on, which is cool. With a few extra lines of python he could have automatically decoded the number to make a linuxy program similar to the one above. It’s close to being convenient! Did anyone else think of “Hey Arnold!” when they read this? There was an episode where Gerald took a video recording of someone dialing a phone and got the phone number from it. This has been done for along time. David Letterman had to mute the phone when he dialed because people were holding their phone to the TV. Before you go and call someone else or their project stupid, why don’t you think about what you’re saying? This is a project to decode tones from videos on YouTube… And where there’s YouTube access, there’s always a computer (well, unless you’re using a smartphone, but thats not whats happening here). So which is easier? Buying a dedicated IC and programming a microcontroller (from your PC, no less) to decode the tones, or just doing it straight from the PC that accessed the video in the first place? Really some of you don’t even think about your comments. hmmm… I wonder could this also be done with the sound from computer keyboard keys?